Trends of the day: Feathers, hearts, and doilies. Wait a second, didn't we see some of these trends yesterday? You sure did! Take a look at how our designers have taken the same trends and incorporated them into a completely different style of scrapbooking. Hi, it's Gabrielle here with you today to share a fun little project I recently made up using the amazing Bo Bunny Misc. Me collections. I just love that there are some really beautiful inserts and designs to create a beautiful Recipes Collection book with Misc. Me! My oldest daughter Chloe has become quite the little chef, she is almost daily experimenting with cooking and baking. So I thought it would be a nice thing to make her up a special recipe book to keep all her recipes in. 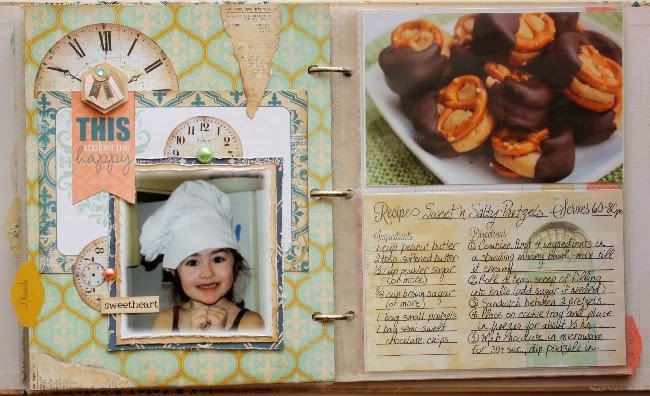 Once I was done putting the book together (most of it blank for her to work in her choices), I thought I would pop in a few recipes she's tried and add a few photos of her and her sister, baking and cooking over the years. Just a little something to get her started. The above photo was taken when Chloe and Meagan went to my sisters house to make Sprinkle cookies, one of their first baking adventures. The recipe on the right is my dear husbands favourite salad that he's always asking Chloe to make for him. Chloe and I made these Bass fillet's breaded in Japanese Panko (bread crumbs), I thought it would be fun to show the photo of Chloe holding the fresh Bass fish she and her dad caught on a fishing trip they took (the fish in the photo are the fish she caught). A fun trend in scrapbooking lately is to use feathers to embellish pages. I wanted to use some natural elements to decorate with so I thought it would be nice to use feathers to accent the page. Designer Tip: I thought it would be fun to try a fun little design trick on these feathers. I've been seeing curled feathers lately online, but couldn't seem to find any in stores. So I decided to try curling them myself. Have you ever tried curling ribbons with the edge of a scissor or the dull side of a butter knife? You do this the same way! Just loosen the strands by running your fingers down along the stem. Then just using the dull edge of a butter knife, start at the base of the strand and run it along the strand (between the knife edge and your thumb). Easy Peasy! When I gave my daughter this book, she was so delighted to have a book she can easily keep adding her recipes to. One of her favorite things about the inserts was the conversion table insert that comes with the recipe cards. I also included a bunch of the pocket style pages available in the Misc. Me collections so that my daughter can keep some of those 'vintage' handwritten recipes that have been passed down through the generations in their original form. I know I love to look at those old (slightly food stained) recipes written out in my mothers beautiful handwriting.....the pocket designs are just perfect for this. My daughter is working her way through the culinary world as a chef. Something that is difficult to do as a female in a male dominated field. Especially because she is only 22 years old. So I decided to use Misc Me to chronicle her triumphs and tribulations. The first hurdle was to graduate from the prestigious Le Cordon Bleu School of Culinary Arts. Misc Me is a perfect album with so many choices of papers, cards and inserts to do a life project on just about any subject. But the recipe version was perfect for this project. Here is one of the first sets of pages in the album. The first recipe is Success. And the main ingredient is hard work. I did some layering from the different collection packs and they all compliment each other to perfection. Mixing and matching with endless possibilities. I have created a flip card waterfall page, so that my daughter can write down her random memories of what she did in school to stay ahead of the game. And in future pages, I will make these flip cards even wider to fit actual recipes. This book will be filled with her own creations. I love using hearts in my projects, because I feel it brings a personal warmth to the pages. I just used some corrugated cardboard to cut out my heart and painted it with some shimmering water colors, then tied it using some twine and added a handmade flower. Using the same color watercolor throughout the 2 pages brought the whole page together. I stamped the word Recipes with the wonderful Kraft Alphabet set. Here is a closeup of the heart on the cover of the flip book. Trends come and go, but I thinks Hearts and doilies will always be around. And the last couple of years I see many projects using doilies. So happy that Bo Bunny has them in 3 sizes. I used the medium and small on these 2 pages. Here is a closeup showing the flip book opened up. The smaller pieces in the Note Paper pack were perfect for this part of my project. I love the wooden adornments in the Kraft Collection. I left them in their natural state. I added a little wooden scrabble G (for my daughters name, Gabriella) in the middle of the smaller clock.I used one of the note pages and punched out some flowers, stacked them and painted the middle with watercolor. I also punched out the leaves and used the same watercolors as in the flowers and corrugated heart. Doilies: Medium 6.5", Small 4"
Such clever and gorgeous Misc Me ideas, ladies! These are great projects! So many clever ideas :-) Thanks Lisa and Gabrielle. Thankyou both for these beautiful layouts. I especially am grateful for the close up on the waterfall feature as I want to do this with small photos of our granddaughters last holiday. Her Mum went mad with the camera!!! Mind you the scenery in New Zealand is pretty stunning.